Pretoria, South Africa – Contrary to some perceptions, Africa is leading the way in preventing criminals, extremists and non-state actors from acquiring the material used to develop weapons of mass destruction. This is due, to a large extent, to the leading role played by the African Union (AU) on the issue over the past four years. 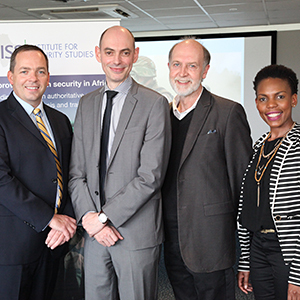 Africa’s progress on ensuring the non-proliferation of weapons of mass destruction was debated at a roundtable discussion today hosted by the Institute for Security Studies (ISS). The event asked whether African states are implementing UN Security Council resolution 1540 effectively, and what challenges remain. Resolution 1540, which was adopted 11 years ago, calls on states to prevent criminals, militant groups and other non-state actors from acquiring or using weapons of mass destruction. This is a major security and developmental issue for African states, given the dramatic consequences if such weapons were ever to be used. ‘Too often, Africa is presented as a continent which lags behind in implementing resolution 1540 and in undertaking necessary measures to prevent non-state actors from getting access to weapons of mass destruction. This is simply not true’, said Raphael Prenat, keynote speaker at the meeting and a member of the Group of Experts that supports the work of the 1540 Committee. ‘A lot has been achieved and, in some aspects, Africa can even be seen as a champion’. Much of this success can be attributed to the AU, which works in synergy with other African stakeholders. ‘The AU is one of the unsung heroes,’ said Nicolas Kasprzyk, ISS consultant and former 1540 Committee expert, commenting on the leading role played by the AU in fostering efforts to implement resolution 1540 on the continent. ‘It facilitates dialogue and cooperation among African partners, such as the regional economic communities and the UN Regional Centre for Peace and Disarmament in Africa, with tangible success on 1540-related matters’. The AU was one of the first international organisations to designate a focal point for resolution 1540 in 2011. In January 2013, the AU requested its Commission to take all necessary steps to implement the proposals and recommendations made at a workshop hosted by the South African government in collaboration with the AU in November 2012 on African states’ implementation of resolution 1540. Since then, the AU has steadily raised its profile on 1540-related matters, encouraging national and sub-regional efforts, and providing training to national focal points. The AU also plans to host an assistance conference in early 2016 to facilitate the delivery of support to African states. The event was part of a project launched by the ISS in 2014 to help African states implement resolution 1540. ‘African states and African organisations are making visible efforts to build their non-proliferation capacity’, says Noel Stott, senior research fellow at the ISS. ‘We all share a collective responsibility to ensure that those efforts bring fruitful results, and that the continent does not become a theatre to the use of the deadliest of weapons – a situation that would severely exacerbate Africa’s developmental challenges’.